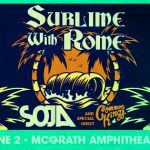 Sublime With Rome will be making an outdoor tour stop at McGrath Ampitheatre in Cedar Rapids on Sunday, June 2. With special guests Soja and Common Kings. Tickets are on sale at Ticketmaster and the U.S. Cellular Center Box Office.